Right from the start, Zac and Mia was interesting. It had the same vibe as this novel, so I wasn't particularly surprised that I instantly found it appealing. 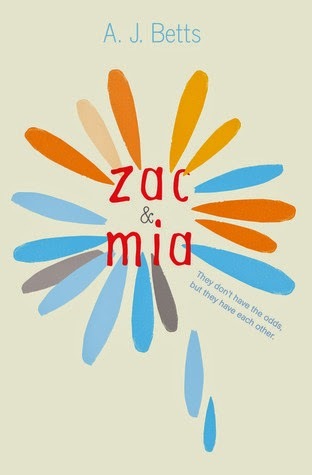 The premise is pretty straightforward, but what I really liked were the two main characters - Zac and Mia. Of the two, Zac is the one I instantly liked. He was really positive, in spite of the difficult circumstances he's in, and I admired his spirit. This is not to say that he didn't have his moments of weakness, because he totally did and that just made him seem human. He's a guy that it seems like it would be easy to be friends with in real life! Mia, on the other hand, is a girl who is prickly and angry and guarded when she first shows up. She's very dramatic, and though it's just a manifestation of her rebellion and anger, it still kind of bothered me. But she experiences quite the transformation, so by the end, I liked her well enough. There are so many facets to this story - family + friendship, attraction + romance. But the biggest element is, of course, the cancer. Cancer is the reason Zac and Mia even cross paths in the first place, since they're being treated at the same place, and cancer is the thing that ties them both together. The different outlooks on life that cancer patients have is certainly part of Zac and Mia, and something I thought made it fascinating. Even though I did find myself engrossed in Zac and Mia at the start, my interest had started flagging by the time we reached the (unexpected) end. My feelings for Zac and Mia are quite muddled, considering it started so strong and had pretty well-crafted characters but had an ending that I'm not sure worked for me, as well as some pretty dramatic moments that felt a little too contrived. So, this time around, I think it's fair to ask you to decide for yourself if you're interested in this one or not!